Purnima Devi (25) with her 21-month-old child, diagnosed with severe acute malnourishment, at the malnutrition treatment centre in Bokaro, Jharkhand. Acute poverty, high illiteracy levels, lack of sanitation and lack of access to nutritious food cause chronic malnourishment among Jharkhand’s children. Now, a pilot project aimed at reducing malnutrition in children in Bokaro district has shown results. I read this article and found it very interesting, thought it might be something for you. The article is called In India’s Poorest State, A Pilot Project Succeeds In Reducing Malnourishment Among Children https://www.indiaspend.com/in-indias-poorest-state-a-pilot-project-succeeds-in-reducing-malnourishment-among-children/. Bokaro, Jharkhand: A frail young nursing mother Purnima Devi, 25, clutched her emaciated baby boy, 21-month-old Gorango Malakar, at the Malnourishment Treatment Centre (MTC) in Bokaro, Jharkhand on August 11, 2018. Weighing just 4.8 kg, the baby was in the ‘red zone’, indicating severe acute malnourishment. Jharkhand is among the top five Indian states with malnourished--including stunted, wasted and underweight--children, according to an IndiaSpend analysis of data from the ministry of health and family welfare’s National Family Health Survey, 2015-16 (NFHS-4). Almost half (45.3%) of Jharkhand’s children below the age of five are stunted, compared to the national average of 38.4%. Again, almost half (47.8%) of Jharkhand’s children are underweight, placing Jharkhand behind only Bihar and Madhya Pradesh in child malnutrition levels, our analysis shows. The infant mortality rate in Jharkhand is 44 deaths per 1,000 live births and under-five mortality rate is 54 deaths per 1,000 live births, compared to national averages of 41 and 50, respectively, according to the NFHS. Acute poverty, high illiteracy among women, underage marriages, lack of sanitation, lack of awareness on nutrition, lack of access to nutritious and sufficient food, loss of habitat and indigenous local food and lack of proper healthcare are major reasons for malnourishment among children in Jharkhand. Despite being a mineral-rich state, Jharkhand has the highest poverty rate in India--13 million out of 33 million population live below the poverty line, according to a World Bank profile of the state. A year ago, the Jharkhand government in collaboration with non-governmental organisation (NGO) World Vision India ran a pilot project through the Integrated Child Development Scheme (ICDS)--a central government scheme implemented by state governments--aimed at reducing malnutrition in children in two blocks of Bokaro district. An IndiaSpend investigation shows that the project’s approach, including door-to-door screening of children, training anganwadi workers and consistent support and monitoring proved effective, as 61% of malnourished children in the two blocks were cured. For the second time in a few months, Purnima’s baby had entered the red zone. Malnutrition in children is detected by measuring their mid-upper arm circumference (MUAC) using a standard tape divided into green, yellow and red zones. The green zone shows malnourished children, with an MUAC between 12.5 and 26 cm. The yellow zone represents moderate acute malnutrition--children with an MUAC between 12.5 and 11.5 cm. Children in the red zone have an MUAC of less than 11.5 cm, revealing severe acute malnutrition and need for emergency medical care. 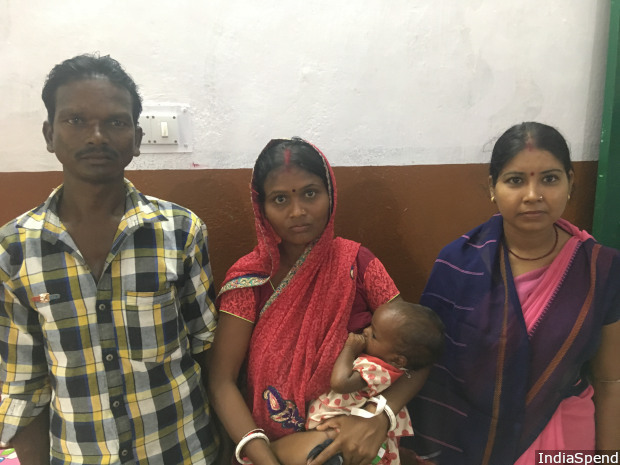 Anganwadi workers who measured her baby’s arm alerted Purnima about Gorango’s precarious health, and recommended she take him to the MTC in Bokaro immediately. The Bokaro MTC has 20 beds, but Gorango was the only patient at the time IndiaSpend visited. This, however, did not indicate fewer cases of malnourishment. Chhaya Mukherji, an anganwadi worker at Tekora village in Chandankiyari block in eastern Bokaro district, told IndiaSpend that, in the two-and-half years that she has worked at the anganwadi centre, she encountered many mothers who were unwilling to admit children at MTCs. Of three children with severe malnutrition in her area, only one baby was admitted to the MTC. “A few mothers fail to understand the gravity of malnutrition, while many cannot afford to quit work,” said Mukherji. In one case, 25-year-old Kusum Devi brought her nine-month-old baby to the MTC only once it was emaciated. “We alerted her early on about the baby’s condition, yet she did not visit the MTC as it is 50 km away from her village and she had no money to commute,” added Mukherji. Kusum Devi (centre) with her husband, their nine-month-old malnourished baby and the anganwadi worker who brought them to the malnourishment treatment centre in Bokaro. Poverty is the underlying cause of Purnima’s predicament. A feeding mother needs to eat vegetables, fibre and protein to avoid malnourishment in herself and her child, but all Purnima eats is leftovers. “I, like every woman in our village, eat last. I have boiled rice and some dal twice a day, depending on how much is left,” Purnima Devi told IndiaSpend. Her family knows she needs better nutrition but can’t afford more food. Purnima’s day is filled with tasks--fetching water, cooking and washing clothes for the family of seven--leaving barely any time for self-care. A majority of women in the poverty-stricken villages of Jharkhand can relate to Purnima’s story. Many nursing mothers here live on two bare meals a day and are under-nourished, leading to malnourished babies. The link between illiteracy and under-nutrition is close and immediate. India’s Census 2011 shows that 76% of Jharkhand’s population lives in rural areas, compared to the all-India average of 31%. Only 46.62% of rural women in Jharkhand are literate, compared to 62% of all rural women in India. Around 67.3% of women aged between 15-49 years and 71.5% of children aged between six and 59 months in rural Jharkhand are anaemic, according to the NFHS, compared to national averages of 53.1% and 58.6%, respectively. Many women are also married off before 18 years, at ages as young as 14, and educating them is a low priority. Around 37.9% of women in Jharkhand are underage brides, the third highest level in the country, our analysis of NFHS data shows. “Ask any new mother what their age is and the answer will be ‘25’,” an anganwadi worker revealed. “Family members are unaware of their date of birth. When enrolling in Aadhaar (the central government-run unique identification programme), many of these mothers mentioned their age as 18. I have personally seen girls as young as 14 dropping out of high school to get married.” Purnima Devi too said she was 25 years old, but appeared to be younger. Unhygienic conditions result in the spread of diseases, another major cause of malnutrition. But sanitation is a far cry in the villages of Jharkhand, where drinking water is often fetched from algae-filled ponds. While India’s burden of disease due to child and maternal malnutrition has been decreasing since 1990, malnutrition remained responsible for 15% of the total disease burden in India in 2016, according to ‘India: Health of the Nation’s States’, a report by the India State-Level Disease Burden Initiative. Nationally, there has been a 9.6-percentage-point reduction in stunting rate in children in 2015-16 compared to a decade prior, but Jharkhand’s improvement rate was half of that, at 4.5 percentage points, our analysis of NFHS data showed. On November 21, 2017, Jharkhand Chief Minister Raghubar Das announced that the year 2018 would be celebrated as ‘Nirog Bal Varsh’ (Healthy Child Year), to address the state’s pressing problem of malnourishment. “The aim is to bring Jharkhand among the top 10 nourished states in the country in the next three to four years,” said Das. However, Jharkhand remains a long way from attaining that goal. On August 19, 2018, a child died at Sadar Hospital and another at a private hospital in Khunti in state capital Ranchi. Within a week, on August 24, another child abandoned by his unwed mother died at Ranchi’s Rajendra Institute of Medical Sciences. All three children were allegedly underweight and suffering from malnutrition. The high numbers of malnourished children in Jharkhand puts a question mark on the efficacy of government nutrition schemes. Anganwadi centres, run by state social welfare departments and the point of contact for most children accessing the ICDS, face a staff and resource crunch in Jharkhand. Supervisors from anganwadi centres in Bokaro district spoke to IndiaSpend anonymously about the toll that the shortage of staff takes on them. “There are 324 anganwadi centres in Bokaro district and none are well equipped,” revealed a supervisor. “Every anganwadi worker is in charge of at least 35 centres--each located far away from one another and not connected by pucca [paved] roads, making service delivery difficult.” Poor, unlit roads in rural Bokaro district worsen the situation. Purnima Devi told us she had had to walk more than 6 km and switch two buses to reach the Bokaro MTC. “We have to travel through wild jungle and poor roads for over 22 km to reach Tekora village from Bokaro. Shuttling between villages is exhausting,” said Rupa Kumari, an anganwadi supervisor from Chandankiyari block. “There are just a few of us but a lot of children in dire need. We wish we could help them all,” said Rupa. The supervisors often have to spend their own money to travel to villages, as the state government has not provided travel allowance for the past two years, said a supervisor. Neither MTCs nor district headquarters have vehicles available to assist supervisors in transporting children in dire need of help. Yet, anganwadi workers have a heavy workload--from sensitising parents to admitting children in MTCs and providing adequate nutrition to mothers and children. A malnourished child should be admitted to the MTC for at least 15 days for medication and observation, but a majority of parents refuse to stay for more than two days, lest they lose daily wages. Anganwadi workers’ responsibilities also include counselling the family to stay for 15 days. The consequences of the acute shortage of staff available for such counselling are thus borne by malnourished children, as chances of a relapse are higher if they don’t go through the full 15-day treatment. Kripa Nand Jha, director of the central ministry of health and family welfare-run National Rural Health Mission in Jharkhand, says steps to curb malnutrition are being accelerated. “Deworming treatment is provided to over 88% of children in Jharkhand, while 75% of them were given oral rehydration salts,” Jha said. This focus on medical supplements is not enough to tackle the state’s child malnourishment crisis. A pilot project has shown that ensuring ICDS and anganwadi centres are well-equipped and training anganwadi workers could be a more effective approach in tackling child malnutrition. A nine-month ‘Community-based Management of Acute Malnutrition’ (CMAM) pilot project running between January and September 2017 in the Chandankiyari and Chas blocks of Bokaro district proved effective in reducing levels of malnutrition in children. The Jharkhand State Nutrition Mission partnered with World Vision India (WV India)--an NGO with experience in system strengthening, supportive supervision and capacity building of health functionaries across India--to run the CMAM project. The project entailed door-to-door screening of children for malnutrition, based on measuring mid-upper arm circumference. WV India trained anganwadi workers, recruited volunteers and monitored the exercise. The programme then focused on treating children identified in the yellow and red zones, with moderate acute malnutrition and severe acute malnutrition, respectively. The results were visible--96 of 158 children (61%) in the yellow zone were cured of malnutrition. Children in the red zone were immediately sent to MTCs. Consistent organisational support from WV India ensured a steady supply of medicines, ready-to-use therapeutic food and point-to-point care of the children, said Pu Selvi. This short-term collaboration with the state government for ICDS implementation yielded positive results, she added. 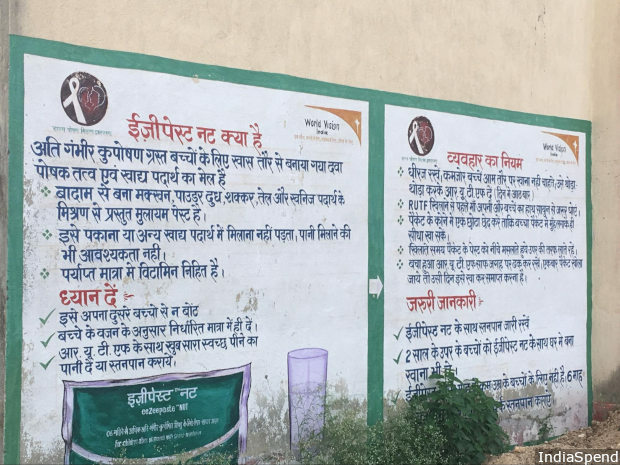 A wall painting at an anganwadi centre in Bokaro district informs people about ready-to-use therapeutic food. Suman Gupta, head of the state social welfare department in Bokaro, told IndiaSpend that the CMAM project managed to address a gamut of issues. “It helped the government comprehend the critical situation of malnourishment and thus provide immediate care to the children. The government was able to manage resources well,” said Gupta. “World Vision enhanced our professional abilities by teaching us ways to communicate with mothers. We could witness mothers slowly focussing on hygiene and self-care. That’s progress,” said an anganwadi worker.